All children under seventeen are Slated if they break the rules, cause trouble, or rebel against society. To keep peace and order, the government supplies the people who are Slated with Levos, which is a device that is attached to you at all times. The Levo’s main purpose is to prevent discord. By thinking of violence, becoming scared, or being angry, the Levo stops the blood circulation to the brain and causes the person with the Levo to black out. If someone tries to take off their Levo, it causes them severe pain and may lead to death. 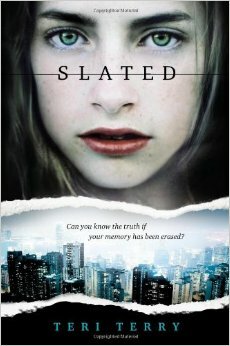 Kyla has been Slated, and her personality and memory have both been wiped out. She is adopted to her family consisting of her mother, her father, and her older sister, Amy. As the story progresses, Kyla goes to school and meets Ben, an attractive young man that has also been Slated, and wants to know about his past. As people begin to rebel against the government, chaos breaks out, and more and more people begin to disappear. Some are taken away by government agents in front of everyone, and some are sneakily sent to the hospital to be Slated. Together, Kyla and Ben attempt to discover the loopholes around the system that may lead them to their past. However, doing so might also affect their future in ways that will not allow any second chances. Similar to many other books that I have read, this book was very slow. The author took a tremendous amount of time revealing the characters and their personalities, which caused the climax to be relatively late in the story. Overall, this book disappointed me. I thought that I would be inseparable from the book, but there were no extreme pivotal moments or plot twists that made it hard for me to abandon from reading. As I continued to read the story, many of my theories had been proved to be true. The ending was also very predictable and the story was not as entertaining as it could have been. I would recommend this book to anyone who likes mysteries mixed with some romance. There was nothing inappropriate, no explicit language, and only a slight mention of drugs, so this would be a good book for children from ages eleven to thirteen. Teens may not find this book sensible because the vocabulary was very weak and the content was also meant for younger children. Because of the lack of liveliness in the story, I would rate this book a five out of ten stars. 1. Why does Kyla’s mother yell at Kyla when they are driving home from the hospital? 1a. Kyla’s mother yells at Kyla because she asked Kyla what she wanted to do, but Kyla did not answer her, possibly showing disrespect toward her mother (Page 10). 2. Based on what was said by Kyla’s mother and father, how are Kyla and Amy different? 2a. Amy was very talkative and giggly when she met her parents, but Kyla seems different, odd, and more paranoid toward them (Page 16). 3. How does Kyla react when she is cut by a knife when washing the dishes? 3a. Because Kyla has never seen blood before, she is fascinated by the bright red liquid flowing down her hand (Page 27). 4. Why is Kyla’s mother sensitive toward Aunt Stacey’s son, Robert? 4a. Before Kyla’s mother met Kyla’s father, she had a son named Robert with another man. After separating from this man, Kyla’s mother met her father and Robert died. In memory of Robert, Aunt Stacey named her son after him. Now, whenever Kyla’s mother sees Aunt Stacey’s toddler, she is uncomfortable (Pages 58-59). 5. Why was Kyla surprised after her confrontation with Phoebe in the bus? 5a. After Phoebe tripped Kyla, Kyla was ready to fight her, but this thought should have caused her to faint, but didn’t. One of the Levo’s main causes was to prevent any violent thinking that may lead to discord, which leads to the stop of blood circulation to the brain (Pages 85-86). 6. What is Mr. Ferguson’s first impression of Kyla? 6a. Kyla arrives to the bus with Ben, so he assumes that she is one of Ben’s groupies and is not there to run, but to only be with Ben (Pages 118-119). 7. Why does Kyla burst into tears when she breaks a glass cup? 7a. Kyla tells her mother that she is crying because she hates broccoli, but the real reason is because she is worried that her mother will send her back to the hospital, similar to what Tori’s family had done (Pages 134-135). 8. After Phoebe snatches Kyla’s sketch book and sees the drawing of Sebastian, why does Phoebe immediately hand the book back to Kyla? 8a. Phoebe works at the animal shelter, so when someone brought Sebastian in, he was given to her and she began to take care of him. Once Phoebe saw Sebastian in Kyla’s book, she was shocked and realized that Sebastian was Kyla’s cat. Later, Phoebe helps return Sebastian to Kyla (Pages 156-159). 9. What does Mr. Gianelli do to make the Lorders arrest him? 9a. In art class, the topic for the day was to draw someone or something that you care about. Mr. Gianelli draws Phoebe and posts it at the front of the class. The Lorders consider this as an act of protest, so he is punished (Pages 185, 189-190). 10. Why does Mr. Ferguson shake his head when Ben and Kyla are done with their run? 10a. Ben and Kyla are both Slated, so they are unable to compete in the cross country team. It is implied that they either broke the track record or simply have a very fast time, disappointing Mr. Ferguson because they are simply not allowed to be on the team (Pages 186-187). 11. Why did Kyla go running when Amy and Jazz were studying? 11a. A couple days before, Kyla saw Phoebe at the hospital. She was in a wheelchair, her personality was insanely different, and Amy realized that she had been Slated. Kyla believed that Phoebe’s parents would want to know that Phoebe was healthy and safe, so she found Phoebe’s address in a textbook and went to her house to inform Phoebe’s parents (Page 235-236). 12. Why did Hatten call Kyla a biological anomaly? 12a. In class, the students were doing an experiment involving looking at a marking with one eye closed at a time. Most of the students could see with the eye on the same side as their dominant hand. For example, right-handed students could see the marking with their right eye. However, it was different for Kyla. She saw the marking with her left eye, but Hatten thought she was right-handed, so it did not make sense. The reason why Kyla was different was because she had been instructed to write with her right hand since she was young, but she had been left-handed all along, as she discovered when she was sketching (Page 246). 13. Why doesn’t Kyla’s mother go places when she drops Kyla off at Group? 13a. On every pole, there are cameras that monitor the identity and position of every car in London. If Kyla’s mother wandered around beyond expectation, she might be punished for it (Page 258). 14. Why does Ben seem more distant from Kyla as the story progresses? 14a. Ben has already set his mind to take his Levo off. Unfortunately, this is a very dangerous task and it is very likely that Ben will die in the process. By keeping away from Kyla, Ben believes that Kyla won’t be associated with Ben when the government finds out that he took his Levo off (Page 287). 15. How does Nico, or Hatten, relate with Kyla? 15a. Nico was someone that watched over Kyla and taught her valuable things when she was young and referred to as Lucy. He trained Kyla to be a shy, pathetic, and innocent little girl, but have an alternate ego as a killer. Eventually, the Lorders took control of Kyla’s brain and she was Slated. Nico changed his clothes, his roles, and his name to Hatten and began to work at Kyla’s school. He must have done something to harm Ms. Fern so that he could become the teacher at Kyla’s school, where he had been trying to make Kyla remember her past so she could be an asset to him for situations in the future (Page 345).